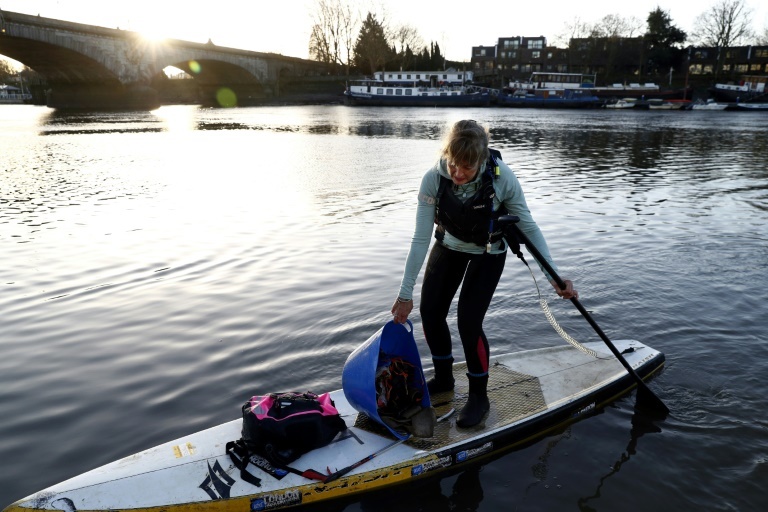 LONDON: Floating on the murky waters of the River Thames in London, activist paddle-boarders are trying to rid the waterway of a plague of plastic waste and draw attention to the problem. As the sun rises on the Thames behind historic Kew Bridge in the west of the British capital, quacking ducks and gliding swans conjured a serene landscape. But on closer inspection, all manner of plastic objects have washed up ashore, including plastic bags hanging from trees. It is this kind of regularly sullied scene that inspired several members of paddle-board association Active360 to launch cleaning sessions of the river and canals that run through London. The founders — Paul Hyman, Louise Nolan and James Roorda — took to the water this week to inspect an island for detritus. Within half an hour, they had discovered enough discarded waste to fill a large bucket. The haul includes plastic bottles, ropes, sheeting, cups “and the most unpleasant plastic bags: dog poop bags which seem to get everywhere now,” Nolan said. Many of these products would take hundreds of years to downgrade. Nolan noted their haul was relatively modest and — depending on the tides — it can be three or four times larger. For her, this small gesture for the environment is “really gratifying”, but Hyman, the founder of the association, struggles with its limitations. “Cleaning it up, the danger is that we’re just hiding the problem,” he said. The association tries to raise awareness about its efforts on social networks and at a festival held in spring. Their latest battle: attempting to convince coffee shops in the capital to abandon disposable cups, many of which fall into the river. “In the UK alone, the amount of single-use plastic wasted every year would fill 1,000 Royal Albert Halls,” she said, referring to the famous London concert hall with more than 5,000 seats. May’s environmental action plan includes extending a small charge for plastic carrier bags — currently enforced at supermarkets — to all retailers in England, as well as urging them to introduce plastic-free aisles. The government will also call for evidence on changes to the tax system or charges on single-use plastic items, such as takeaway containers. However environmental advocates have criticised the proposals as too modest, in particular, the pledge to eliminate all avoidable plastic waste only by the end of 2042. The European Union wants to phase out single-use plastics, aiming to make all packaging reusable or recyclable by 2030. Corporations also appear to be responding to the growing climate of concern around plastics. On Tuesday, budget supermarket chain Iceland, which specialises in frozen food, announced it would remove all plastic packaging from its own branded product lines within five years. Coffee and convenience goods chains like Starbucks, Pret a Manger and Costa Coffee also increasingly compete in “green” proposals, offering discounts to customers who bring their own mugs and charging more for their disposable cups. “This year there is definitely a change in the air,” said Hyman, though he remains unconvinced by May’s plans. “What the government announced last week was interesting but it wasn’t very tangible,” he said. As he plays his part in the evolving anti-plastics revolution, Hyman urged others “to think about their own lives and the plastic they use, and to think about what they don’t really need to use.